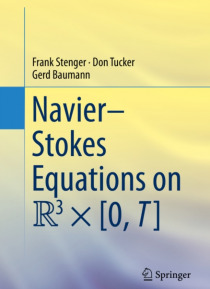 In this monograph, leading researchers in the world ofnumerical analysis, partial differential equations, and hard computationalproblems study the properties of solutions of the Navier-Stokes partial differential equations on (x, y, z,t) [0, T]. Initially converting the PDE to asystem of integral equations, the authors then describe spaces A of analytic functions that housesolutions of this equ… ation, and show that these spaces of analytic functionsare dense in the spaces S of rapidlydecreasing and infinitely differentiable functions. This method benefits fromthe following advantages: The functions of S are nearly always conceptual rather than explicit Initial and boundary conditions of solutions of PDE are usually drawn from the applied sciences, and as such, they are nearly always piece-wise analytic, and in this case, the solutions have the same properties When methods of approximation are applied to functions of A they converge at an exponential rate, whereas methods of approximation applied to the functions of S converge only at a polynomial rate Enables sharper bounds on the solution enabling easier existence proofs, and a more accurate and more efficient method of solution, including accurate error boundsFollowing the proofs of denseness, the authors prove theexistence of a solution of the integral equations in the space of functions A [0, T], and provide an explicit novelalgorithm based on Sinc approximation and Picard-like iteration for computingthe solution. Additionally, the authors include appendices that provide acustom Mathematica program for computing solutions based on the explicitalgorithmic approximation procedure, and which supply explicit illustrations ofthese computed solutions.